The roofing on a house is arguably one of the most important features. The quality of the materials chosen will either protect against weather and insect damage, or leave a home vulnerable to costly repairs. 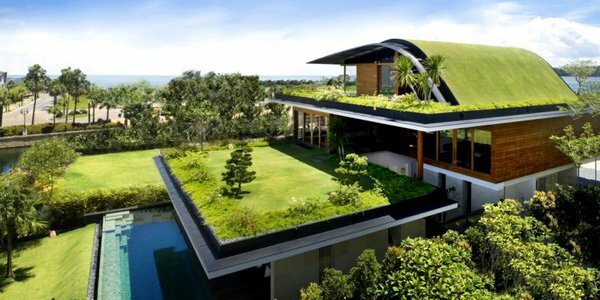 Roofing can also be used to make a house more eco-friendly. Properly chosen and installed, roofing can cut down on the environmental impact of a home, from the production stage of materials to the amount of energy a house uses daily. There are hundreds of products to choose from, and narrowing them down can take some time. Here are a few options to consider in several different price ranges. The pricing on recycled roofing materials can vary widely. One option is to use synthetic tiles made from recycled postindustrial waste. This helps prevent waste from ending up in a landfill, and many of these synthetic tiles are also recyclable. That means that when it comes time to replace the roof, the materials can be recycled rather than thrown in the rubbish. Recycled synthetic roofing tiles tend to be a fairly affordable option for most homeowners as well. Another option for recycled roofing is terracotta tiles. These tiles are beautiful, and can be made from old pavers, bricks, or roofing tiles. They do tend to be more costly and they add quite a lot of weight to a roof. Before installation, it is important to make sure the underlying supports can withstand the extra weight. Chipped or cracked tiles will need to be replaced periodically, and old tiles can be recycled.